A study released in Nature Geoscience describes how climate change played a major role in the massive catastrophic collapse of two glaciers in the Tibetan Plateau in July and September 2016. 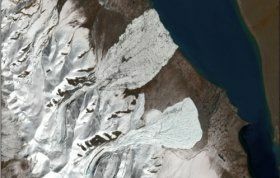 The spectacular collapse, featured by The Atlantic magazine last year, was captured in more-or-less real time using remote sensing data by an international team of researchers, which included Dr. Stephen Evans, a professor of Earth and Environmental Sciences at the University of Waterloo and Director of Waterloo’s Geological Engineering Program. The team analyzed high-resolution remote sensing data from a variety of satellites between 1961 and 2016. Thermo-mechanical modelling of the collapsed glaciers showed how meltwater, due to climate change, initiated the collapse, with ice flows traveling nearly 8 km at speeds of 140 km/hour. It’s the first detailed documentation of massive surge-like instability in the literature and identifies a new catastrophic hazard associated with mountain glaciers.